We welcome students of all abilities, providing their command of English is sufficient to enable them to access and benefit from an English medium education, and offer them not only a broad and balanced curriculum but also opportunities to develop into responsible members of the adult community. In Years 12 and 13 students continue their education by choosing the International Baccalaureate (IBDP) Diploma, the IB Career-Related Programme (IBCP), the International Diploma (ID), The WIS Engineering pathway (see International Diploma) or the Foundation Diploma. Choosing which pathway to take can be an extremely difficult decision. The decision should only be made after students are sure they have all the information needed. Students will need to seek the advice of a whole range of people including parents, teachers, the careers team and various subject teachers. Students will also need to carry out some of their own research into universities and possible future careers. Time is given in assembly time, in individual meetings with tutors and the higher education counsellors, in Learning 4 Life lessons and at the Options Evenings to help prepare students for this decision. Staff are dedicated to advising students of the most appropriate pathway for them in order to maximise success. Students on the Foundation Diploma will follow a programme specifically tailored to their needs, developing the skills required for future work or university placement. Courses might include work skills, entry level Mathematics and English courses, vocational BTEC Level 2 or 3 courses and IB courses where appropriate. Students choosing the WIS International Diploma are expected to have attained at least four (I)GCSE levels ranging from A* to C, in one sitting. ​Each student will be advised as to his or her suitability for a particular course by subject teachers and the Guidance and Achievement team. There is flexibility on this course as to what formal qualifications can be achieved. THE WIS Engineering Pathway is for students hoping to take an applied route into an engineering career. Details are given in the ID subject pages. For some students, this may be takes as part of the IBCP, dependent upon individual circumstances. Students are expected to have at least five (I)GCSE levels ranging from A* to C (including Mathematics and English) in one sitting to being the IBCP. This course allows for specialization, should a student have a clear vocation in mind. It consists of a BTEC Level 3 National Diploma (Major) and at least 2 IB Diploma subjects. Alongside this, students study an IBCP core programme. The IB courses are the only examined components, all other elements use ongoing assessment. 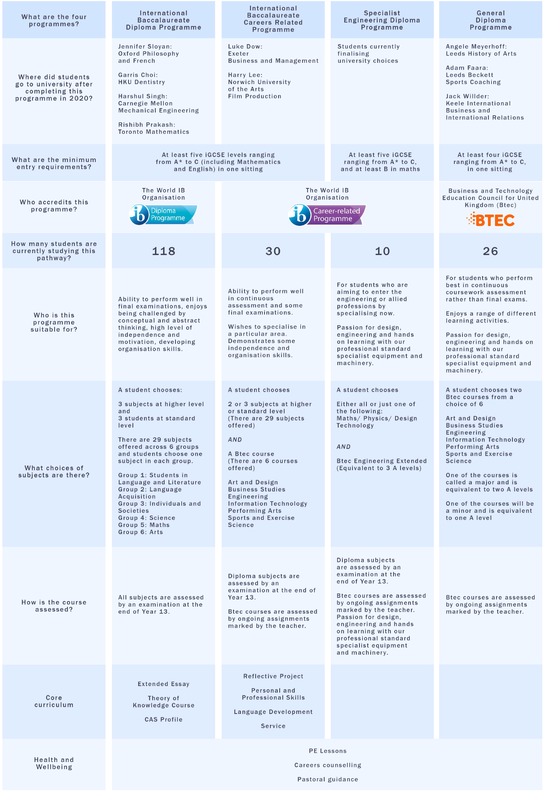 Students are expected to have at least five (I)GCSE levels ranging from A* to C (including Mathematics and English), in one sitting, to begin the IB Diploma. ​A very high level of independence, motivation and constructive energy will be required in order to be successful on the IB Diploma course. Please be sure to note the WIS Arts Policy on the IBDP information pages. While West Island School is happy to give advice, it is the student’s responsibility to ensure that they are fully informed before making any decisions about options. The Careers team are on hand for advice, as are tutors, the Head of Year 11, Directors of Learning and the IBDP and IBCP/ID coordinators. Please see ‘useful contacts’ page. Availability of Subjects: While we endeavour to provide a flexible range of options to best suit the needs of individual students, it should be noted that the options on offer are subject to change and we cannot guarantee that all the individual courses within each diploma will run. All subjects are on offer dependent on there being sufficient demand.